MONDAY, Nov. 3 (Health.com) — About 90% of Americans ages 8–16 play video games, and they spend about 13 hours a week doing so—even more if they're boys. 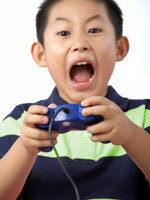 Now a new study suggests that virtual violence may make kids more aggressive in real life. According to the study in the journal Pediatrics, children and teens who reported playing violent video games had more aggressive behavior months later than their peers who did not play the games. The researchers specifically tried to get to the root of the chicken-or-egg problem: Do children become more aggressive after playing video games or are aggressive kids more attracted to violent games? It's a murky—and controversial—issue. Many studies have linked violence in TV shows and video games to violent behavior. In fact, many states have tried to restrict minors' access to games rated M for mature, but the video game industry, as well as free-speech activists, have often successfully challenged the proposed restrictions in court. In the new study, Craig A. Anderson, PhD, and his colleagues at Iowa State University, in Ames, looked at the ways that children and teen's video game habits at one point in time related to their behavior three to six months later. The study included three groups: 181 Japanese students age 12 to 15; 1,050 Japanese students age 13 to 18; and 364 Americans age 9 to 12. The U.S. children listed their three favorite games and how often they played them. In the younger Japanese group, the researchers looked at how often the children played five different violent video game genres (fighting action, shooting, adventure, among others). In the older Japanese group, researchers gauged the violence in the teens' favorite game genres and the time they spent playing them each week. The Japanese groups rated their own behavior in terms of physical aggression, including violent acts such as hitting, kicking, or getting into fights with other kids; the U.S. children rated themselves too, but the researchers also considered reports from their peers and teachers. In every group, those exposed to more video game violence did become more aggressive over time, as opposed to their peers who had less exposure. This was true even after the researchers took into account how aggressive the children were at the beginning of the study, a strong predictor of future bad behavior. The findings are "pretty good evidence" that violent video games do cause aggressive behavior, says L. Rowell Huesmann, PhD, director of the Research Center for Group Dynamics at the University of Michigan's Institute for Social Research in Ann Arbor. There are two ways violent media can spur people to violent actions, says Huesmann, who has been studying violence in media and behavior for more than 30 years. First is imitation; children who watch violence in the media can internalize the message that the world is a hostile place and that acting aggressively is an OK way to deal with it, he explains. Also, he adds, kids can become desensitized to violence. "When you're exposed to violence day in and day out, it loses its emotional impact on you," Huesmann says. "Once you're emotionally numb to violence, it's much easier to engage in violence." But Cheryl K. Olson, ScD, codirector of the Center for Mental Health and Media at Massachusetts General Hospital in Boston, isn't convinced. "It's not the violence per se that's the problem; it's the context and goals of the violence," says Olson, citing past research on TV violence and behavior. There are definitely games kids shouldn't be playing, she says—for example, those where hunting down people and killing them is the goal. But she argues that the label "violent video games" is too vague. Researchers need to do a better job of defining what is considered a violent video game and what constitutes aggressive behavior, she adds. "I think there may well be problems with some kinds of violent games for some kinds of kids," Olson says. "We may find things we should be worried about, but right now we don't know enough." Further, she adds, playing games rated M for mature has become "normative behavior" for adolescents, especially boys. "It's just a routine part of what they do," she says. Her advice to parents? Move the computer and gaming equipment out of kids' rooms and into public spaces in the home, like the living room. That way, parents can keep an eye on what their child is up to. David Walsh, PhD, president of the National Institute on Media and the Family, a Minneapolis-based nonprofit, argues that the pervasiveness of violence in media has led to a "culture of disrespect" in which children get the message that it's acceptable to treat one another rudely and even aggressively. "It doesn't necessarily mean that because a kid plays a violent video game, he's immediately going to go out and beat somebody up," Walsh says. "The real impact is in shaping norms, shaping attitude. As those gradually shift, the differences start to show up in behavior."